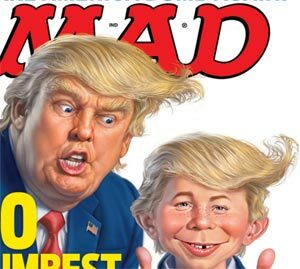 Donald Trump may have lost out on being Time Magazine's "Person of the Year" but neither Trump nor Alfred E. Neumann are worrying; he made Mad Magazine's "Man of Year" cover! **New Article Oct 2017: Changing Donald Trump's Personality? Impossible Dream? Bold, Brash, Bombastic! The consumate "entertainer" according to Carly Fiorina. As Danielle Poirier has stated: "Extraverted Sensing personality types [ESTP and ESFP] are pragmatic and realistic with a zest for living life to the fullest . . . ."
Trump, The Promoter. As Linda Berens describes ESTPs: "They are highly gifted negotiators, entrepreneurs and salespersons, and they know how to maximize every moment of their waking hours. Indeed they are people who love life in the fast lane and they are masterful at inching things along in their direction when it comes to interpersonal interactions. They thrive on action and the use of all available resources at hand, sometimes to the point where the goal justifies the means." (Working Together, Isachsen & Berens, 1998) . Born under different circumstances, Trump could have been Richard Sherman, Seattle Seahawks All-Pro cornerback with his flowing dreadlocks, taunting and challenging opponents to throw the ball to the guy he is covering. He is confident he will win; he will beat you. So that's the broad brush on Trump and his ESTP profile. It's his dominant Extraverted Sensing mental orientation that is the leading edge of his personality. Being engaged with the outer world with all of the senses is his life force. Action and engagement fuel his energy and the more he gets the more he wants. But it is also more than that, without it the fire goes out. But as the ESTP Faces Diagram illustrates, Extraverted Sensing isn't the only mental prominent process of an ESTP that is engaged with the outside world. Lets dive down and look at some of the details. Extraverted Feeling. Because Trump is a realist and says what he thinks, he sometimes (detractors would say often) says things others find hurtful. Some would say he is unfeeling. But Trump does have a Feeling nature but it is in a supportive versus a dominant role. You see his Extraverted Feeling in his dialogue and pronouncements . . . "That's smart, that's stupid, that's right, that's wrong, he's very good, she's low energy, etc." Feeling judgment is that way: clear dichotomies and subjective. I like or don't like. Good or Bad. Not nuanced or analytical. Feeling knows what it knows and no need to analyze it. You can also see Trump's extraverted feeling nature in a way we more commonly associate with feeling. He is a fun-loving guy and can turn on the charm. You can also see it in his close relationships with his children (from three different marriages); their clear loyalty and affection for him. In an interview for People magazine Trump maintains he always prided himself on being a "good father . . . with my children, I was always available." The author of the People magazine article observes "And, after two difficult divorces, Trump's kids credit him for maintaining great relationships with both ex wives – and fostering closeness among the kids." Trump's Hidden Face. Because Trump is "out there," speaks boldly, seems quite impulsive and a loose cannon people wonder "Wow, is this guy we'd want to have his finger on the Nuclear button? Can we trust this bull in the china shop? He says these nutty things, can we trust him to be piloting this plane?" This is understandable, especially with an ESTP like Trump who loves fun, entertaining with flair, having an impact on others and pulls no punches. His media exposure and extraverted nature so dominates our understanding of who he is. We seem him as one dimensional; his inner nature is hidden. But lets dive down into that. As the ESTP Faces diagram indicates, Donald's inner nature is led by Introverted Thinking, supported by Introverted Intution. 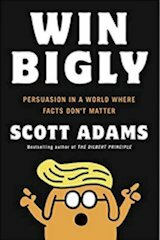 While The Donald may seem at times to be an emotional decision-maker, at his core he is very logical, objective, and firm-minded. It is the below-water rudder that keeps him on course. You'll see his inner Thinking nature in some of his public persona. At times an interviewer might voice to him a criticism of Trump that sticks. He won't like it but he'll purse his lips and say "OK, that's fair" or otherwise acknowledge that you "got me on that one" (but then of course keep charging on undeterred). At other times, you'll see him pause for a brief moment as he is runs the question through his inner calculator and then spit out the succinct answer. That inner Thinking rudder is behind his being able to "take a punch" and behind his pragmatism and being realistic. Like all ESTPs Trump's inner Thinking helps him parse out what is real from what is not, what is important for now, what is not. Sorting, critiquing, analyzing - but often in the background. Curious about your own Myers Briggs Personality Type? Take our online self-scoring "Personality Test" and learn more about Personality Types. Inner Intuition also is evident. It fuels his vision; it's why he thinks BIG, on a grand scale. His media personality is so dominant, we forget that he built his career as a real estate developer and builder whose projects featured unique and attractive architectural design. You can also appreciate this "inner NT architect" in looking at his Presidential campaign. 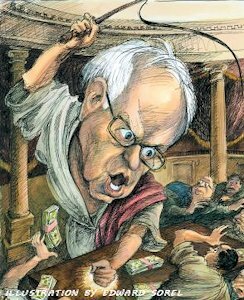 People are now beginning to realize there is a shrewd strategy or design behind how he has conducted his campaign. He has gotten his message out there, captured all the attention he needs, while having to spend very little money on advertising or media spots. He also is not indebted to any particular donor class. This shrewd campaign design or strategy may not have been scripted out in some sort of systematic detail ahead of time. It may have flowed as much from Intuitive instinct honed to perfection and confidence through many years of creating big real estate development projects and dealing with media and public officials. Whether by careful design or years of playing experience, Intuition is part of the picture. As impulsive as Trump might appear, his track record is one of making the right moves at the right time and when he has fallen, able to recover. Like other successful ESTPs it's that inner Intuition and Thinking that keeps the ship going in the right direction, even when occasionally it appears to be blown off course. This crazy man, Mad Magazine's Man of the Year, didn't succeed in the business world for forty five years without something else going on behind the screen of the show OZ has been putting on for us. Some have argued The Donald is actually an ESTJ type - see my post on this topic. - - Donald Trump vs. Hillary Clinton - comparing their contrasting styles and temperament. Archetypal Preferences for President. In the last Presidential election, it was INFJ Architect Obama versus ISTJ Manager Romney. America chose the Architect. Trump, the ESTJ Promoter and Developer, hasn't liked the Obama architectural plan nor the execution of it. He has a different vision of what America can be: "We can be great, again!" If he succeeds in getting the Republican nomination, he may be up against INTJ Director Hillary Clinton, who he sees as essentially adopting the Obama Screenplay but who will certainly put her own twist on it. Which Archetype will prevail? Next Article, More Archetypal Choices. Trumps differences with Obama and Clinton also go to temperament. Introverted Intuitives have a quite different action orientation than Extraverted Sensors. Trump sees them as "low energy" and people who plod along, spending far too much time naval gazing and delaying action. They are not players, they are planners. They fiddle while Rome burns. While Trump respects his fellow competitor Ben Carson because of his competence in his field and his intelligence, he has some of the same instinctual aversion to Carson's low energy style which is clearly Introverted and reflects a cerebral Intuition. In a later piece I'll hope to examine Carson's MBTI affiliation - which I believe is INTP. But next, I discuss another populist candidate: Bernie Sanders, INFP Idealist. New Article Oct 2017: Changing Donald Trump's Personality? Impossible Dream? Is Donald Trump's Personality Evolving? - - - Different temperaments, different styles, each with their strengths and weaknesses.